so quite a substantial amount of math and physics went into this work. Question: What does the color represent, could it be some kind of "temperature" or energy density of distorted space on the event horizon surface? Why can I see some evidence of rotation in the resulting merged object for a few rotations, then it disappears? What else (if anything) can be learned from this video? The colors encode the lapse function — the slowing of the rate of flow of time. Unfortunately, the LIGO gallery has not preserved this information (nor the links to published papers where more details seem to be given) so it is hard to say in this specific case. Also simply understanding what many of these quantities are needs a fair level of differential geometry. Why can I see some evidence of rotation in the resulting merged object for a few rotations, then it disappears? Since we don't know what quantity is being depicted, it's a bit hard to be very precise, but there is an established concept of "ringdown". You may have heard the phrase "black holes have no hair" meaning that from outside everything about a (non-quantum) black hole is determined by its mass, spin and charge, with no details (the hair) remaining. This is not exactly true. What is true is that any "hair" a black hole has is quickly radiated away as gravitational waves so that it rapidly approaches the ideal state given by its mass, spin and charge. This phenomenon is called "ringdown" and is what you are in seeing in the first moments after the collision. It can be detected in the gravitational waves. Not the answer you're looking for? Browse other questions tagged black-hole general-relativity gravitational-waves merger or ask your own question. How close would merging black holes have to be to feel gravitational waves? 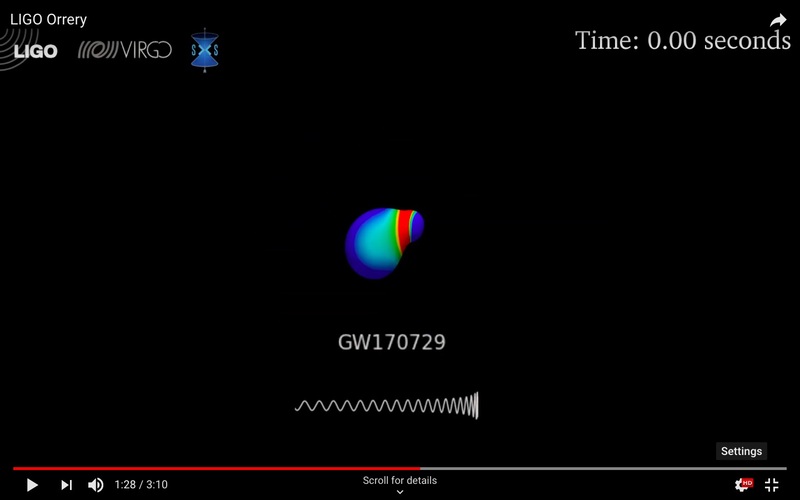 What is the detection threshold of gravitational waves for LIGO? Could gravitational waves near merging black holes collapse to a black hole themselves? Would LIGO Detect Head-On Collision?